Although wrapped in Legends of history, the mentioned archeological finds do underwrite the development of early sedentary civilization in China at around 6- to 5000 years BC. The most well-known find is found on the outskirts of present day Xi'an in Shaanxi Province , a city that would later remain at the center of early civilization and was home to the Capital of Han and Tang Dynasties. Here the Ban Po neolithic village gives a good insight into what the dawn of Civilization in the far east on the eur-asian continent was like. Other sites include those near Yangshao Village in Henan Province , the Shandong Province Longshan Culture finds and even some finds at Wanfujing in Beijing , Hebei Province . The centralized state, only distantly similar to today's political situation, developed somewhere in the 3rd century BC and was first truly established and developed by the Chin Shi Huangdi and his short-lived Chin Dynasty (221 BC - 207 BC) . Slowly a feudal system as we know it evolved, through several stages. As Time advanced, each Dynasty would have its own power-structure and organization, depending on needs, philosophic and technical developments. The better organized, the more powerful militarily. The Silk Road was a transcontinental trading path connecting Asia , Entire, North Africa and Europe. Countries connected through the main pathways of the land-bound Silk Road are China , Kyrgyzstan , Afghanistan , Pakistan , Uzbekistan , Kazachstan , Turkmenistan , Tibet , India , Syria, Iran, Iraq , Egypt (Cairo and Alexandria), Turkey, Italy (Rome). Apart from the Main Route there are several parallel pathways traversing North around the Caspian Sea and along the Eastern Shores of the Black Sea. Today these territories include the countries of Azerbaidjan , Armenia (ancient part of Persia), Georgia and parts of Ukraine and Russia. In the South-East ran another minor Silk Road pathway, best identified as the South route of the Silk Road from China to India. This trade route included the Nations of China ( Yunnan Province ), Myanmar (Bhurma), Tibet (Autonomous Region of China) and Qinghai Province . The Silk Road inside of China and the Chinese Empire, which was established during the Wu Di Reign of the Han Dynasty and thus active from the 2nd century BC onwards, led westward from the Han Dynasty and later Sui Dynasty and Tang Dynasty capital at Ch’ang An (near Xi'An ), via Lanzhou where the Yellow River was crossed into the Hexi Corridor of current day Gansu Province . In the Hexi Corridor all Pathways had to pass through the JiaYu Pass, since 1372 AD the location of JiaYuGuan Fortress on the Great Wall of China . From JiaYuGuan the route led on to Dunhuang (Tun-huang) at the edge of the Taklamakan Desert. At Dunhuang the Chinese Territory ended and the pathways of the Silk Road diverge to the North and South. The North pathway leads through Jade Gate (Yu Men) past Lop Nor Lake to Turpan and further along the Tarim River Basin and the Northern Edges of the Taklamakan Desert to Kashgar . Equally, the South Route out of Dunhuang leaves out of Sun Gate Pass (Yang Guan) to head south along the Cherchen and Keria Rivers to reach Khotan and then Kashgar along the South Rim of the Desert, while keeping along the North Rim of the Tibet-Qinghai High Mountain Plateaux. The two pathways out of Dunhuang , last bastion of ancient China , reunite at the City of Kashgar in far western Xinjiang-Uygur Autonomous Region . Kashgar today, is the westernmost destination on the Silk Road in China. points at Damascus , Palmyra and Alleppo (in current day Syria). After the days of the Chin, the earliest Great Wall of China finally enabled successive Dynasties and Chinese peoples to conquer the West and thus open up the famed Silk Road, which would be the economic life-line for further development and contacts with the world. The silk road was won by the Han Dynasty, in a long and protracted conflict with the Xiong-Nu (later dubbed "the Huns") Tribes to the North in Mongolia . The Silk Road was developed further by the succeeding Dynasties, leading to the High Point of Trade and Cultural exchange during the Tang Dynasty (618 AD - 907 AD) Era. Ultimately, the Silk Road would remain crucial to Chinese Development, Culture and Economy until roughly the mid 14Th Century, when development of international overseas trading routes (the Maritime Silk Road), mutal hatred with Central Asian Tribes combined with the political situation in self absorbed Ming Dynasty China ended trade on the Silk Road by Imperial Decree. READ ON IN: Chronology Silk Road History (7) "Manchu Empire, Qing Dynasty and the Silk Road (1644 AD - 1800 AD)". Whichever way it was, during the earliest days of Civilizations in China, the western Hexi Corridor - China's Gateway to the West and a vital pass on the Silk Road - was already a vital conduit of People, Wares and knowledge. It was probably even before the very beginning of the Shang Dynasty Era that the existance of an Oasis Lake at JiaYuGuan underneath the Qilian Shan provided for the abundant watersource needed to sustain an agricultural enclave or settlement that could support travelers from East and West. 1000's years later JiaYuGuan would become the End of China and the location of the Westernmost Fortress on The Great Wall of China (Chang Cheng) , built in protection of the Chinese Heartlands as well as the vital economic artery of the ever developing Silk Road land trading paths. According to legend, the foundations for Chinese civilization and what is now known as the Xia Dynasty, were laid by the Three Emperors and Five Sovereigns. Among these is the well-known Yellow Emperor, a leader an scholar also said to be responsible for the earliest foundations of traditional chinese medicine and who's Queen is said to have been the first to raise silk-worms and develop a primitive silk industry. Shen Nong, another of the Emperors is said to be responsible for creating the first primitive farming tools, such as the hoe and the wooden-plow. Whichever way it was, during the earliest days of Civilizations in China , the western Hexi Corridor - China's Gateway to the West and a vital pass on the Silk Road - was already a vital conduit of People, Wares and knowledge. 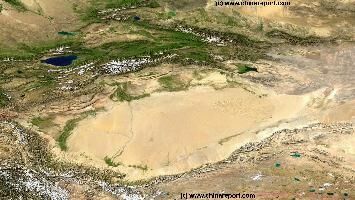 It was probably even before the very beginning of the Shang Dynasty Era that the existance of an Oasis Lake at JiaYuGuan underneath the Qilian Shan provided for the abundant watersource need to sustain an agricultural enclave or settlement that could support travelers from East and West. 1000's years later JiaYuGuan would become the End of China and the location of the Westernmost Fortress on The 10.000 Li Great Wall of China (Wan Li Chang Cheng) , built in protection of the Chinese Heartlands as well as the vital economic artery of the ever developing Silk Road land trading paths. Only when primitive script was invented, with some signs still recognizable in today's Chinese characters , the earliest histories started to be recorded. READ ON IN: "Chronology o/t Silk Road (8) Modern History of the Silk Road \Part 1 (1800 AD to 1900)". This Art, beforehand developed in Western Civilizations, but as yet unknown in the Far East, is thought to have spread from Central Asia into China along these Routes. Archeological finds on Mummies of apparent European Descent in the Desert Graves in Xinjiang Autonomous Region ( Khotan , Cherchen , Loulan and others) strongly suggest such an event. The Birth of First Walled Cities was seen in the fertile Chinese Plains of Shanxi - and Shaanxi Provinces a first version of script appeared and for all practical purposes is was the beginning of recorded history in China (The Shang Dynasty Era left inscribed sea-shells and bones, evidence for the invention and development of primitive script in this Age). From these groups of people, the first complete societies only arose at around 5000 BC. In China these societies/tribes were located in the lower reaches of the Yellow River , counted many more citizens and spawned the first true villages and cities. - Around 2900 BC the so called Longshan Culture developed in the middle regions of the Yellow River . This culture continued on to around the year 1500 BC. - By 2500 BC: worked copper artifacts appear in China and in the Indus Valley of northern India (and Pakistan ). Not much later copper implements are widely used as tools of war (It is unclear if the copper was smelted or hammered). 1459 BC: In the 22nd Reign of King Thutmose III (sometimes read as Thutmosis or Tuthmosis III, Thothmes in older history works, and meaning "Thoth is born") the sixth Pharaoh of the Eighteenth Dynasty of ancient Egypt, who's territory incorporated parts of the southwesternmost parts of the pre'-silk road, the frightening appearance of a comet was observed and duly recorded, as it was the most astounding sight the world had ever witnessed. According to records of what was to be the first ever recorded, dated and preserved comet sighting in human history; "a brilliant disk much larger than the full moon" was seen, adding that it was “a marvel never before known since that foundation of this land (Egypt).” As revealed through the 1973 unearthing of Mawangdui Silk Texts of the Western Han Dynasty (206 BC - +/- 6 AD) , Chinese astronomers, were apparently already meticulously recording celestial occurrences for astrological purposes. The ancient Mawangdui Silk Texts depict the comet as one of the largest ever observed. Not only did it fill a large part of the sky, it had an astonishing ten tails. (The biggest comet observed since the birth of modern astronomy, De Cheseaux’s Comet of 1744, had only seven. ).